11/5/2004 11:23:02 AM Mountain wlj:: sss, for lowest price and margin check out gofutures.com f.a.s.t trading platform is for daytrading. 11/5/2004 11:16:48 AM Mountain sss:: any sugestion for e-mini broker out of e-signal platform ??? 11/5/2004 10:48:54 AM Mountain jst:: I guess I was stupid. Until now, I did not see Al's comments on the chaos page. 11/5/2004 10:08:31 AM Mountain jst:: Thanks, TG. I must sound pretty stupid, but I have read the tuturials 2 or 3 times already and I still am not sure I understand things well enough to see where he is buying and selling. 11/5/2004 10:08:01 AM Mountain wlj:: jst, i think dr.al was plus 12 points yesterday.....a lot of lines on the screen, once you learn what they are it all will be clear. 11/5/2004 9:58:42 AM Mountain TG:: I don't think so. not for the whole day at least. last comment was that near term low might be in and he thought we might see congestion/trading range. Al's very flexible and can change his mind on new evidence pretty quickly. But, he used his indicators to make net 4.25 on the up move and 4 more on the down move. A great day already. 11/5/2004 9:50:08 AM Mountain jst:: Thanks. For the record, is he calling for a low here? 11/5/2004 9:45:46 AM Mountain TG:: Click on "Home" in top left corner of this page. There you'll see past chaos clinics. So you can see what the thought process was behind many trading days. Also, as mm said go to "list of charts" and do the moontide tutorial and the other tutorials just below that one "natural times", "trading band update" etc. 11/5/2004 9:39:59 AM Mountain mm:: Go to LIST OF CHARTS, then to "Trading Moon Chart Tutorial"
11/5/2004 9:37:08 AM Mountain jst:: Thanks, mm. The chaos clinic site has a quite a lot of lines on it. How does one use them? How does one tell when a trade is entered? 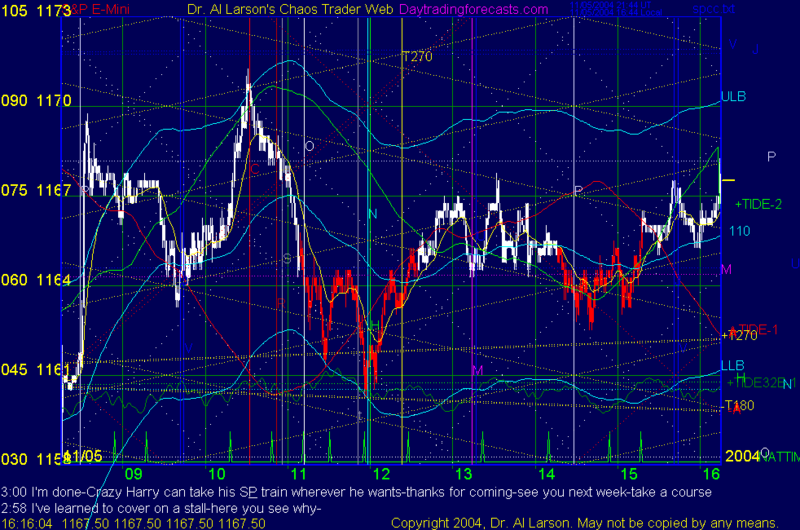 11/5/2004 7:38:45 AM Mountain wlj:: fwiw, some guru's saying we test 1170 today or mon then pull back for a few days.